Throughout these warm days of June, lotus flowers are blooming in numerous ponds around Hanoi, cooling the hot summer air in the capital. Vietnamese people have a special love for lotus flowers due to their pink colour and cool fragrance. The 5,000 square metre lotus pond of farmer Nguyen Van Hanh in Ninh Xa village, Ninh So commune, Thuong Tin district, Hanoi is famous for its valuable lotus species from numerous localities around the country. 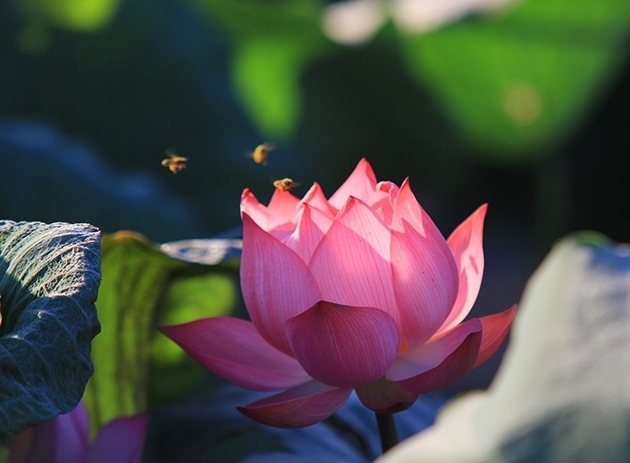 A Bodhisattva’s lotus throne shaped flower in Hanh’s pond. Thousands of beautiful lotus flowers blossom in Xuan Dinh ward, Bac Tu Liem district, Hanoi. During weekends, visitors, particularly young people, flock to lotus ponds to take photos with lotus flowers. Lotus flowers bloom until the eighth lunar month, an undeniable inspiration to the Vietnamese arts.